Look of the day: Shop til you… crash? Today’s look also includes lots of the new mesh items I splurged on to treat myself. I do love these Radical Boots from Maitreya. 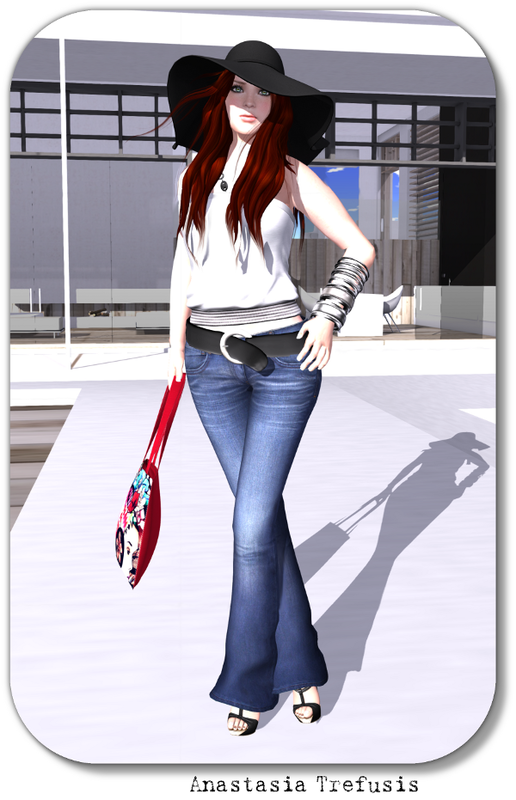 The first boots I ever bought in SL were Maitreya’s “Dune” boots in black. These new boots are like an updated version of those and I think are destined to be a new wardrobe staple as the others were back in 2007/08. Maitreya’s leather satchel is a nice big slouchy bag that matches perfectly with my new boots. I’d love a RL version of this to hold all my junk! I picked up this tunic dress from Jane and then spent way too long looking for pants or leggings to wear under it. I settled on these cords from Doppelganger which I’ve had for ages. It’s a relaxed, comfortable look. Perfect for a day of shopping or for teleporting around SL looking for nice spots to take pics… ahem.